With a wealth of smart beta indices to choose from, market participants may find it difficult to decide when each factor-based strategy is best suited to deliver returns. Is it wise to rely solely on the performance of one factor? If not, what multi-factor approaches could be considered and how effective are they?" 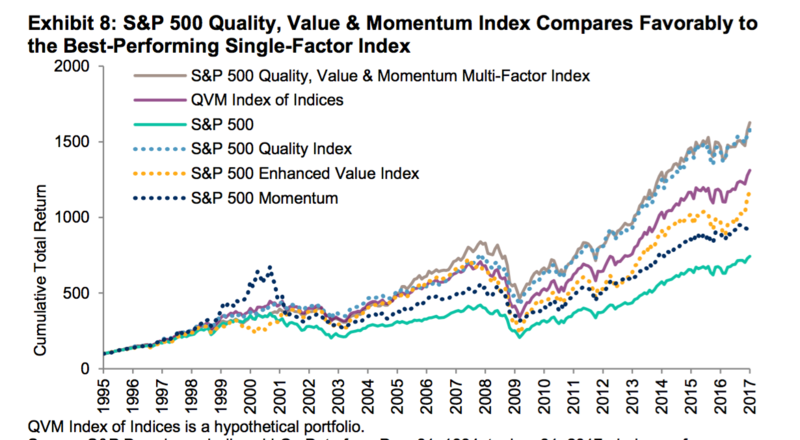 @underscored - it's quite flattering that S&P have copied our QVM Venn. :-D - they aren't the only ones to have done so. We are well ahead of the curve here. Frankly though (personally) I wouldn't touch any of these packaged ETFs. They are all designed for scale. That means the best QVM opportunities in small caps (that the Stockopedia community are so adept at taking advantage of) are normally massively underweight in packaged scale ETF products. My view is that factor ETFs are for the birds. This though is a nice chart that shows the long term outperformance of these factors. There is another multifactor presentation from Patrick O'Shaugnessy (son of James O'Shaugnessy - “One Up on Wall Street” fame). Patrick has opted for Stocko type multi-metric QVM factor combinations, with a tilt to particular factors in the various funds they offer. O'Shaugnessy offers Large and Small caps factor funds, recognising Ed's point that only Large caps have sufficient $Billion capacity to absorb heavyweight investment. I do wonder whether the fabulous 30%+ AIM 100 gains over the last year reflects a lack of UK Small cap investment capacity and that institutional Trusts/ETFs etc are driving up prices in the largest of this AIM segment. Happy hunting grounds for Stocko high QVM and QM stocks at the moment though. One lesser known positive factor that gets a mention for outpreformance is from company share buybacks schemes, but only with those with significant 12 month re-purchases and high Value scores. Do any such companies come to mind? Numis might fit the bill? Good QVM score and repurchased £22.9 worth of stock in 2017. They state that their intention in the medium term is to reduce the number of share in issue. So, doing more than just offsetting new share issues. Ed, I might have imagined this but I seem to remember you once mentiond the notion to turn your NAPS/SNAPS concept into an ETF type product at some point in the future. Or did I just make that up?